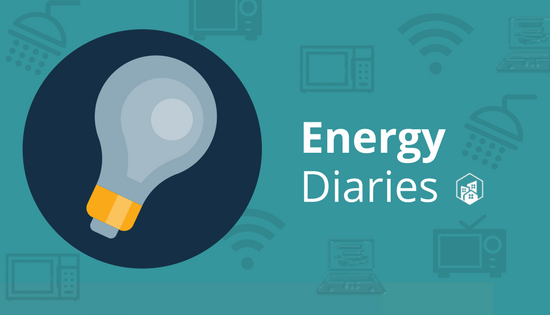 Welcome to our new series Energy Diaries, where we’ll track electricity use to help you make changes that save energy – and money. 7:30 a.m. – I want to smash the alarm; instead I just turn it off. Roughly. Next stop – my phone; it has been plugged in all night, although I know it eats up electricity. I do unplug the charger. I switch the light on in my closet, select my clothes, then turn the light off as I walk out. Next, I turn on the light in the bathroom and hop in the shower. Energy Saving Opportunities: I could charge my phone before I go to sleep to avoid leaving it plugged in overnight. My showers last about 15 minutes, which could be shortened to save water and electricity. Plus, I could lower the thermostat setting on my water heater to 120 degrees. 8 a.m. – Once I’m dressed, I turn off the light in the bathroom and check to make sure my thermostat is at 78. I sleep in cooler temperatures but program my thermostat to rise to 78 degrees at 7:30 a.m. The upstairs will stay at this higher temperature until 9:30 p.m. unless I override it. Downstairs, I open the blinds instead of turning on lights. Although this makes the house warmer, I figure I’ll save more on lighting than I’ll spend on turning down the temperature a few degrees. My home has a split A/C unit, so I can control the temperature downstairs without changing the settings upstairs. This saves money on my electricity bill. Energy Saving Opportunities: I could program my air conditioning to turn off when I’m not home. 9 a.m. – After tidying the living room and kitchen a bit, I make toast. I get the butter from the refrigerator and close it quickly. I keep things I use often in plain sight to avoid keeping the refrigerator open too long. Once I’m done eating, I rinse my plate and put it in the dishwasher. 12 p.m. – I don’t have much planned, so I set out to do some work left over from the week. My laptop is dead, so I plug it in and get to work. Energy Saving Opportunities: I shouldn’t bring my laptop home when it’s dead. If I charge it at the office, I don’t need to use my electricity at home. 3 p.m. – I’m done with work responsibilities, so I unplug my computer and realize that I’m starved. I have shrimp and veggies in the fridge, so I put them on a sheet pan to roast at 400 degrees for 15 minutes. After eating, I put the dishes in the dishwasher. Energy Saving Opportunities: Avoid the oven over the summer. Instead, I can make more foods that don’t require cooking or heating. 5 p.m. – I usually reserve weekends for home projects, so I go to the hardware store for some essentials. I turn off the A/C before I leave. Once I return, I bring in the supplies through the garage using the garage door opener. Armed with paint and brushes, I turn on the lights and ceiling fan to help ventilate the room while I paint. Energy Saving Opportunities: The garage door opener uses electricity to open and close, so I should use the front door instead. 8 p.m. – It’s dark, so I turn on some lights as I head downstairs for food. I settle on leftovers from lunch. I pop the shrimp and veggies in the microwave and use it as filling for fajitas. I take advantage of the microwave whenever possible because it uses less power than the oven or stove. Fajitas eaten, I put the plate in the dishwasher and, noticing it’s full, set it to wash. I like to run the dishwasher no more than twice a week to save on electricity. Energy Saving Opportunities: I should set the dishwasher to run with cold or warm water to save on water heating. Also, I could disable heated drying and let the dishes drip dry. 10 p.m. – Time for bed, so I turn off the lights downstairs and head up to my room. The A/C temperature drops to 72 degrees around this time thanks to my programmable thermostat. I turn on the television to the news before I go to sleep. I don’t bother turning it off before I fall asleep because it’s on a timer that turns it off after an hour of inactivity. 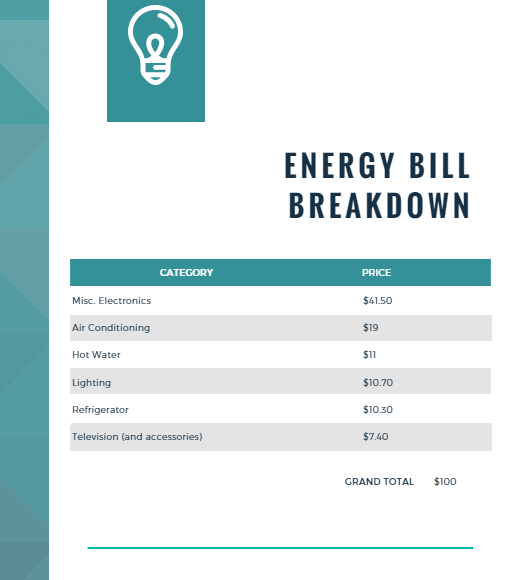 Energy Saving Opportunities: I know the low temperature adds significantly to my electric bill. I could get used to sleeping in warmer temperatures. Despite the timer on the television, it shouldn’t be left on if I’m going to fall asleep. 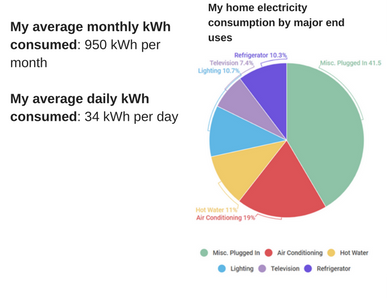 As I recorded my energy consumption, I noticed I spent the most energy on the things I don’t realize are on all day. I was surprised these miscellaneous objects that are plugged in all day take up more energy than air conditioning and lighting combined. 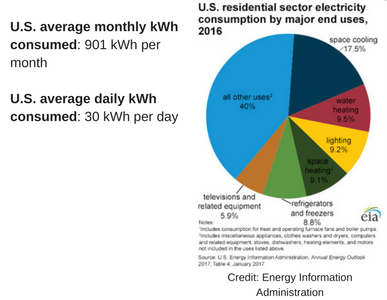 How does your energy consumption compare to the national average?